Recurring eCards make it easy to celebrate birthdays, anniversaries, send reminders and more! 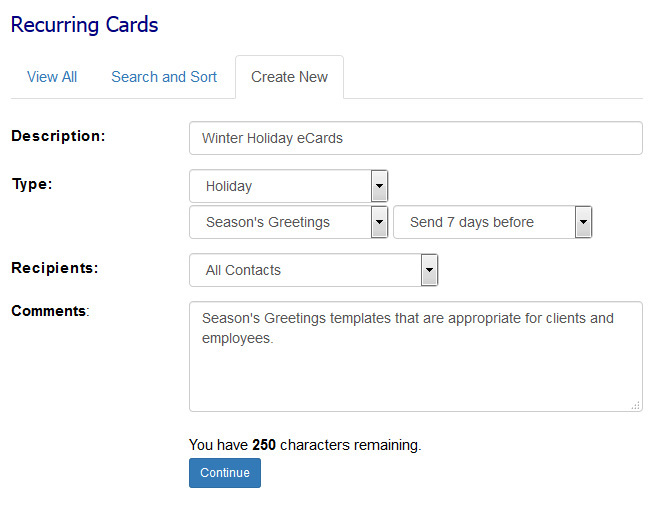 Recurring eCards require you to create at least one 'eCard template' that will be sent to your recipients. 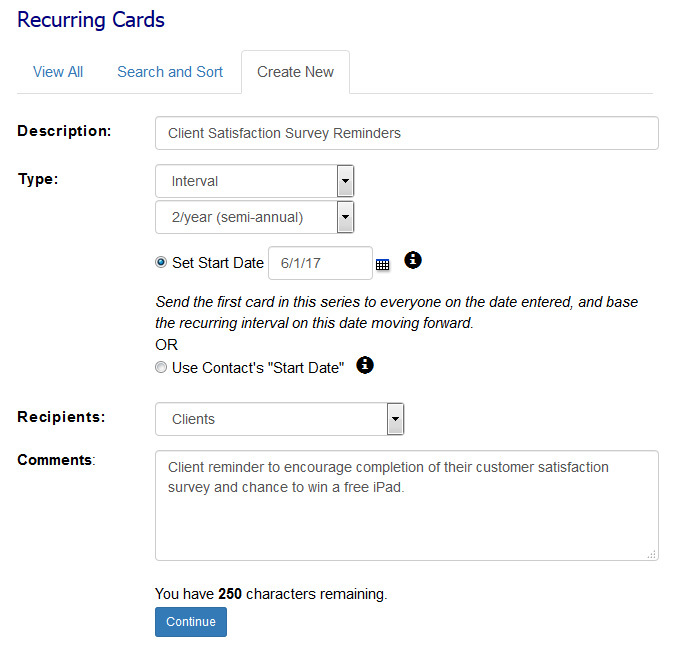 We recommend that you create multiple eCard templates and choose to send them either randomly or in a particular order to your recurring eCard recipients. You must also create a 'Group' of recipients in your Address Book, which is the list of people that will receive the recurring eCards. 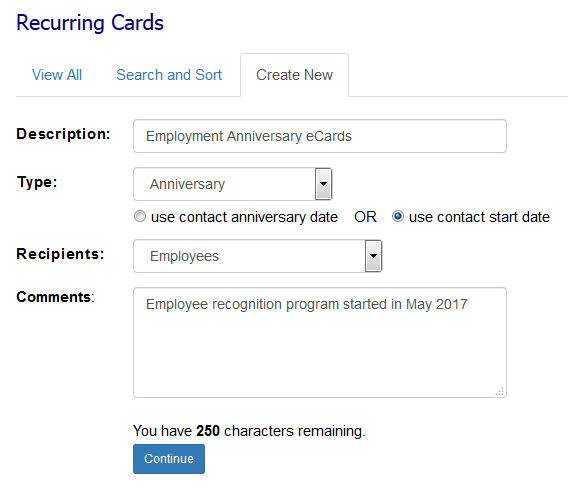 Remember that in order to send recurring birthday or anniversary cards, the contacts you select in your group need to have a valid birth date or anniversary date. In the navigation, go to eCards > Recurring eCards, and then click the 'Create New' tab to get started. You will not see the 'Create New' tab until you have created at least one Group in your Address Book and one eCard template. CorpNote allows you to create and maintain multiple Recurring eCard campaigns. 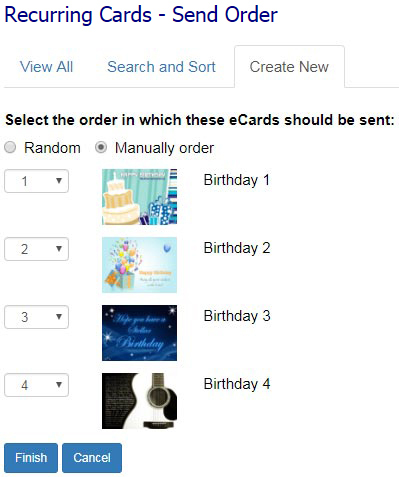 For instance, you may have two recurring birthday campaigns – one for employees and one for customers – which each have different messages and birthday card images. To do this, you need to create a set of eCard templates designed for each audience, and then create two separate address groups - one for employees and one for customers. Description: Name your eCard series something you will easily remember and will help you when using the search feature. Only you will see this information. If you are using a contact's birth date, anniversary date or start date and have included a contact in the group of recipients that does not have this information, you will see a warning. You can either continue and adjust this information later or cancel and change your address book before continuing. Select the eCard Template(s) for the recurring eCard series by checking the box under each thumbnail. To filter, you can show eCards only in specific "categories" you created when you set up your eCard templates. When you are finished selecting all of your templates, click "continue". We recommend starting with a wide variety of eCard templates for birthday and anniversary eCards so no recipient eventually goes through all of the eCard templates. You can access recurring eCards that have been sent by going to eCards > Sent eCards. 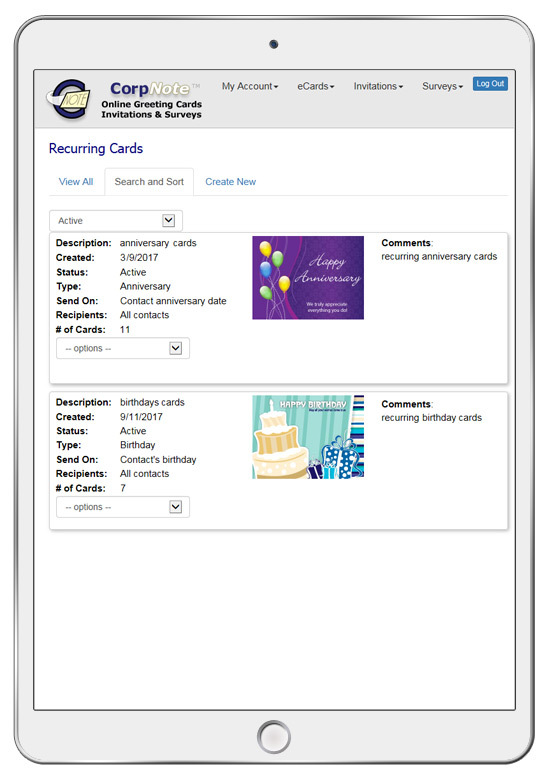 They will display intermixed with your other sent eCards but you can use the "Search and Sort" feature to display only recurring eCards. They are easily identifiable by this icon next to the envelope that shows eCard views. Edit: You can edit the description, the group of recipients and comments. You can also stop the recurring eCard series from sending by changing the status option to "inactive" or if it has not been sent to any recipients yet, select the red "Permanently Delete" option. View: Enables you to see the scheduled eCards in the next 30 days. You will also see any applicable warnings such as contacts without a birthday on recurring birthday eCards and the templates assigned to the series. You can only delete recurring eCards that have not been sent to any recipients. To stop a recurring eCard series, make it "inactive" rather than deleting it. Editing your recurring eCard series works the same way as when you added it. Editing it will display three different screens: general settings, selected eCard templates and eCard sort order.